Fundamental to everything we teach here at MGE is that dentistry is a PEOPLE business. It’s not about the teeth, it’s about the people who are attached to those teeth. Building a productive, expanding, and profitable practice enables you to help more patients get healthy. And in a similar vein, we also believe that as we become more successful ourselves, we have a responsibility to go beyond the bounds of our own businesses and lend a hand to those less fortunate than ourselves. Each and every person is capable of making a difference in their own community. When we come together, though, and work on something larger we can start making changes in the world at large. So, in addition to encouraging our clients to contribute to their own individual causes, we offer opportunities for them to join forces with us and together make an impact on a broader scale. Here are some snippets of the charity and other activist endeavors that MGE and MGE clients are involved in around the nation. Once again this Holiday Season, MGE clients came through in a big way to give underprivileged children the opportunity to improve their futures. 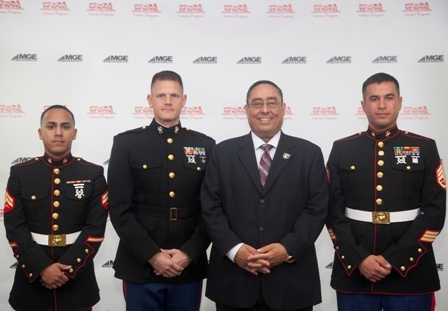 MGE: Management Experts and their dental clients from across the nation gathered with US Marines November 14, 2014 for the MGE Annual Benefit Dinner to raise funds for the Toys for Tots Literacy Program. This year’s event raised funds for hundreds of thousands of new books and audio books for the Toys for Tots Literacy Program that will go to underprivileged children this Christmas. It represents another major strike in the battle being waged against illiteracy and helping underprivileged children break the cycle of poverty. The National Center for Children in Poverty reports that over 16 million children live in poverty. Through the gift of a book, these children are provided with the tools they need to give them a chance to help break the cycle of poverty, one child at a time. Read the full story here! MGE Management Experts CEO, Mr. Luis Colón, is supporting DC Strategic Solutions (DCSS) in demanding that more accurate testing and diagnosing be done to protect the health and lives of veterans as an alarming number of them are committing suicide every day. Per a V.A. report, approximately 22 veterans take their lives every day. The Center for Public Integrity reports, “49,000 veterans (all wars) killed themselves from 2005-2011 – more than double the rate of the civilian population.” “These deaths are appalling and unacceptable. I think there needs to be some immediate and obvious steps taken that can help address this,” said Mr. Colón, also a Veteran. Read the full story here! MGE Management Experts Executives and Staff raise funds for the Nourish to Flourish Program to help feed 1,370 chronically hungry children in Pinellas County. The donation was presented to Pinellas County Public Defender Mr. Bob Dillinger November 24, 2014, to kick off the holiday season. “It was shocking to learn that there are so many chronically hungry children right here in Pinellas County. Over 40,000 businesses make their home here, and if we all worked together in a shoulder to shoulder effort we could provide enough food for each of these children overnight. 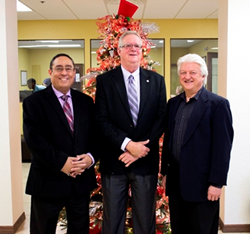 I would like to challenge each Pinellas County Business to donate to the Nourish to Flourish Program,” said Mr. Colón. Read the full story here!